We are at a decision point. Which route will you take? 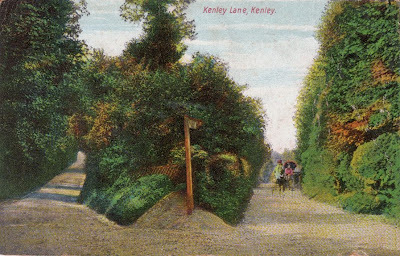 As it happens both roads lead to the same place: Kenley Common. It now has an aerodrome with gliders where you can walk round the perimeter. Back in the days of this postcard I expect it was still a grazing common. Which will you choose? Or have you walked far enough and will you go back with your friends to Kenley to enjoy some afternoon tea.